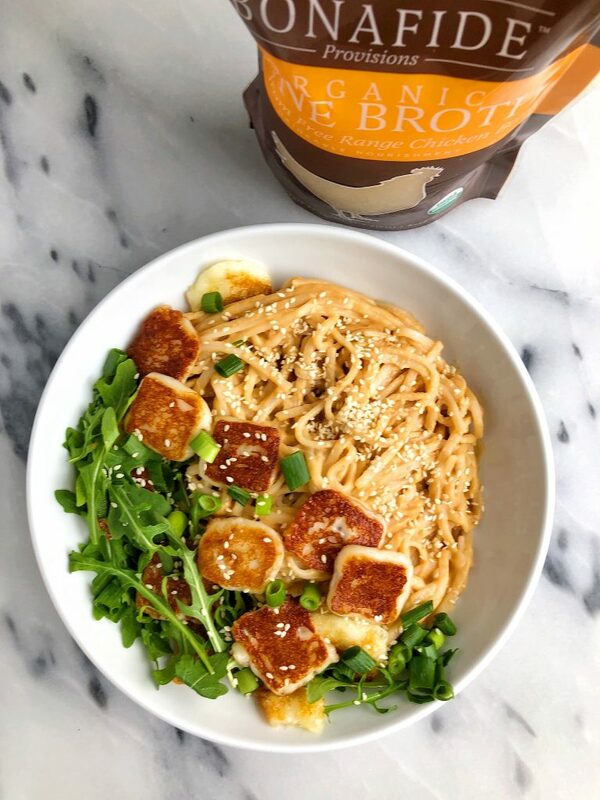 Easy Sesame Peanut Tahini Noodles with Halloumi for an healthier spin on a takeout noodle bowl! Made with all gluten-free ingredients. These nooooooods. You guys. I can barely keep it in my pants right now. Forever swooning over any bowl of cozy noodles with a creamy sauce of sorts but this one has won me over. 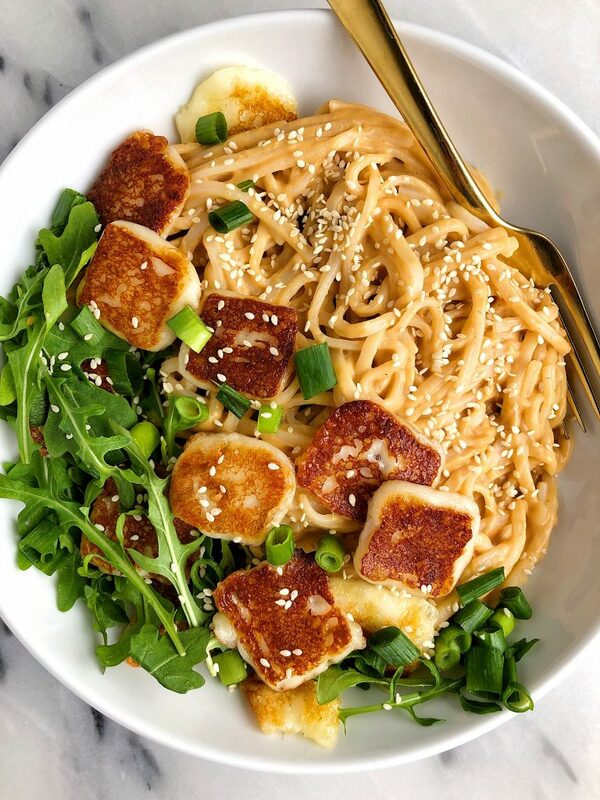 Allow me to introduce the easiest Sesame Peanut Tahini Noodles with grilled halloumi on top. I am looking for anything and everything simple and easy these days that also makes some leftovers to last us for a few days. These noodles do just that. This recipe is made with all gluten-free ingredients and the creamy sauce? YUP, it has both tahini and peanut butter in it. I combine creamy tahini, peanut butter, coconut aminos (instead of soy sauce), hot sauce, Bonafide Provisions Organic Bone Broth and a couple other gems to make the most flavorful sauce to pour on top of the gluten-free rice noodles. Cooking with bone broth is truly a staple over here. Our fridge and freezer is always stocked with some broth for sipping and cooking. It adds so much flavorful to the recipe and some extra collagen and protein to it. Bonafide is my personal fave after trying many of the bone broths on the market (more on bone broth here). You can find it in most national retailers in the freezer section. I also love making 10-minute Bone Broth Cauliflower Fried Rice, Homemade Bone Broth Ramen Bowls and Skillet Turkey Burgers with their broth too. The possibilities are endless. 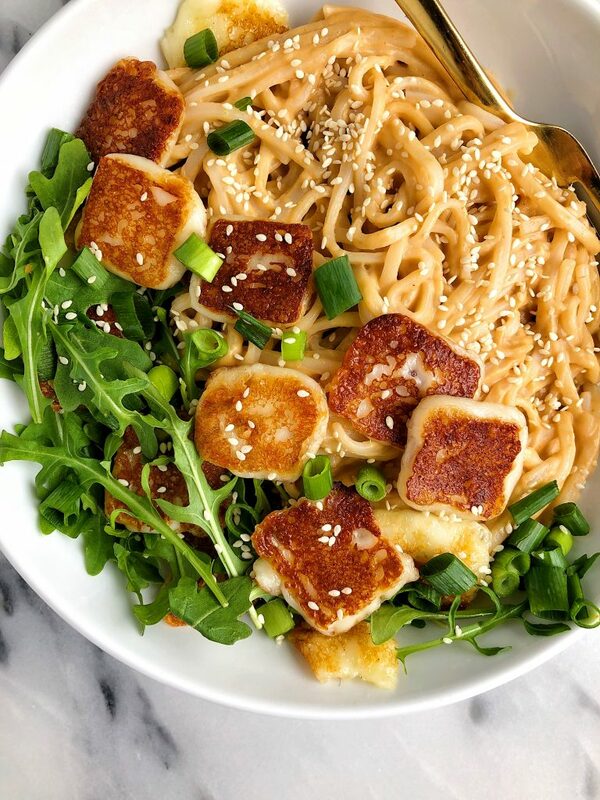 But for now, enjoy these Sesame Peanut Tahini Noodles and the flavor bomb. Especially when you add that grilled halloumi on top. Or feel free to add any other toppings you wish. I added slice chicken a couple weeks ago too and it was delicious! Add noodles to bowl of choice and enjoy! Thank you Bonafide Provisions for sponsoring this post! It means so much to me to partner with brands I love and use everyday!